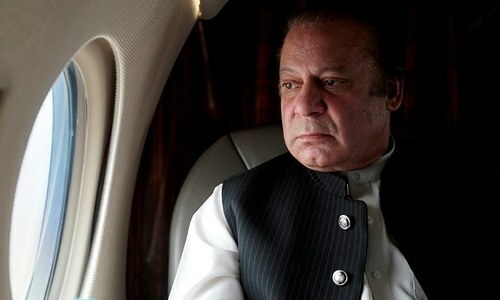 ISLAMABAD: A parliamentary committee on Tuesday summoned National Accountability Bureau (NAB) chairman retired Justice Javed Iqbal to appear before it on Wednesday to give an explanation over the bureau’s move to initiate an inquiry into alleged money laundering to India by PML-N’s supreme leader Nawaz Sharif. The National Assembly Standing Committee on Law and Justice headed by ruling Pakistan Muslim League-N (PML-N) MNA from Sahiwal Chaudhry Mohammad Ashraf summoned the NAB chief hours after the issue was raised by Rana Hayat Khan while speaking on a point of order in the house and was referred to it by former law minister Zahid Hamid who was presiding over the session at that time. The committee, which is also set to take up an important constitution amendment bill seeking merger of the Federally Administered Tribal Areas (Fata) with Khyber Pakhtunkhwa, shows a five-point agenda issued by the NA Secretariat for the hurriedly-called meeting. Last week, Prime Minister Shahid Khaqan Abbasi had criticised NAB on the floor of the National Assembly for its “faux pas” over the alleged $4.9 billion money laundering to India by Mr Sharif. Mr Abbasi also read out the controversial press release that had been issued by NAB announcing that the bureau had started verifying whether Mr Sharif was involved in sending the money to India. According to NAB, the World Bank’s migration and remittance book released in September 2016 carried information that foreign exchange reserves of India increased by $4.9bn after receiving the huge amount sent through money laundering, inflicting losses to Pakistan’s national kitty. While the World Bank promptly responded to the NAB move and stated “the report does not include any mention of money laundering nor does it name any individuals”, the State Bank of Pakistan said the estimates showed in the WB report were based on “assumptions” which did not reflect the reality. Lashing out at the NAB chairman for ordering a probe merely on the basis of a media report, the prime minister had asked NA speaker Ayaz Sadiq to constitute a special committee to summon the NAB chairman and seek an explanation. However, Mr Abbasi’s proposal to form the committee was rejected by the Pakistan Tehreek-i-Insaf (PTI) whereas the Pakistan Peoples Party (PPP) and the Muttahida Qaumi Movement had sought time for consultation with the leadership on the issue. When the opposition reminded the ruling party that it had rejected a similar demand of the opposition parties when the Panama Papers scam had surfaced some two years ago, Parlia­mentary Affairs Minister Sheikh Aftab had admitted that it was their “mistake”. The prime minister had termed the NAB’s latest action “pre-poll rigging”, saying the allegations of money laundering against Mr Sharif were being levelled at a time when general elections were just two months away. He had also sought the opposition’s cooperation in amending the accountability laws, saying they still had time to do it before the expiry of the National Assembly’s term on May 31. “The NAB chairman should be summoned to clear his position as a very serious allegation of sending money to the enemy country has been levelled against the former prime minister,” Mr Abbasi had said. Hours after the prime minister’s speech, NAB issued a statement clarifying that it was conducting the verification of the allegation as per law. The bureau rejected “the impression of revenge or hurting anyone” saying NAB “does not believe in revenge and (is) determined to eliminate corruption without any discrimination”. It said that the bureau’s press release was based on a media report which had referred to the World Bank’s Migration and Remittance Fact Book Report 2016 alleging the sending of $4.9bn to India. According to the alleged media report, it said, Nawaz Sharif, former finance minister Ishaq Dar, former governor of State Bank Ashraf Wathra and former deputy governor of State Bank Saeed Ahmed were allegedly involved in money laundering of $4.9bn. The PPP protested over the government’s move and announced that its committee members Syed Naveed Qamar and Shagufta Jummani would resign on Wednesday. When contacted, Naveed Qamar said they had decided to quit the NA panel as they believed that the committee chairman had summoned the NAB chairman with mala fide intentions. Sources said that the committee members belonging to the PTI could also take a similar step to register their protest. The committee is also set to take up the Constitution Amendment Bill that had been tabled by the government last year seeking merger of the tribal areas with KP. The bill had been tabled by Federal Minister for States and Frontier Regions retired Lt Gen Abdul Qadir Baloch in line with the recommendations of the special committee on Fata reforms under the then adviser on foreign affairs Sartaj Aziz by former premier Nawaz Sharif to suggest ways for the mainstreaming of the restive tribal areas bordering Afghanistan. Despite having the support of the opposition parties, the government, however, stopped the process when the move was opposed by its allies — Jamiat Ulema-i-Islam-F chief Maulana Fazlur Rehman and Pakhtunkhwa Milli Awami Party chief Mehmood Khan Achakzai. 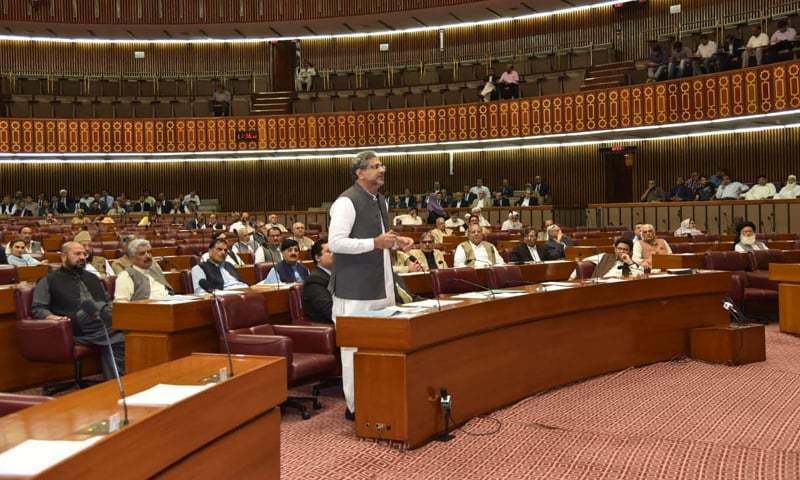 It was only last week that Prime Minister Abbasi again announced on the floor of the house that the government wanted to see Fata’s merger before completion of its five-year term on May 31. 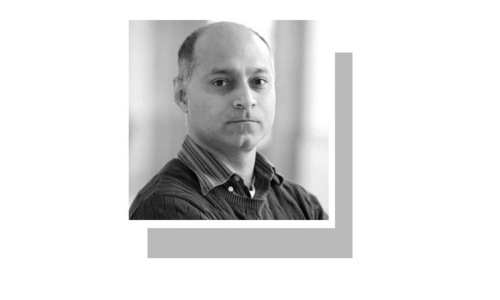 Later, the PM had two meetings with the parliamentary leaders of all the parties, but the political leadership failed to develop a consensus when both Maulana Fazl and Mr Achakzai continued to stick to their stance. The bill seeks to amend Article 106 of the Constitution which specifies number of NA seats allocated to the provinces. NAB has not formally accused NS but wants to check how and why such accusation appear in media. The hue and cry is to bring pressure for giving clean chit to Shairf family in Panama case as opined by opposition. NAB chairman should not go. Appearing before the House on a matter such as this amounts to inteference with the NAB, and this ruins the independence they should have. If the NAB is grilled whenever it investigates the ruling party's wrongdoings, then it can't function properly. These agencies forced NS to go all out against themselves. Last chance for political parties to cleanse the system otherwise the coming generation will blame them only. These members cannot call Chairman NAB, neither he should go. What is Next? NA will call CJP to clarify why and how they are calling NS every day for NAB trial? Impressed by the speed at which NAB took up some random media report to launch investigations without even a cursory check. Seems like if u need to get NAB attention on Any person with any frivolous claim a you need to do is put articles in newspapers and they will start investigating. Half of Pakistan's leaders day is spent bashing and defaming each other. No wonder government projects never get finished. Parliamentary committee never bothered to summoned Nawaz Sharif on Panama Leak corruption and money laundering. Finally NAB has decided to go after corrupt politicians, let the NAB do their job, majority of parliament members are corrupt and dishonest, they are afraid of NAB chairmen. Whats wrong if NAB is investigating validity of a news? It seems that NAB has not accused any person by name. Asking questions to anyone does not constitute breach of their privacy or reflect bad on any official in public life. Public officials are elected to be accountable to public and can be asked questions on important matters relating to state or its people. NAB will be discredited publicly by the NA panel after grilling its Chief who has quite obviously gone horribly wrong! NAB to get a taste of its own medicine. Chairman NAB Justice (R) Javed Iqbal is an honourable man holding a prominent position. He should not play in the hands of those forces that act as catalysts and then fish in the troubled water between the government and NAB. Levelling allegations of money laundering to India against Mr. Sharif sans proof is unfortunate and beyond comprehension. Such illogical, irrational and irresponsible charges distort credibility and image of the NAB, which in turn weakens public trust in the august institution. Nab Chief should explain his source of information, his ground work to confirm the information. He is definitely accountable and answerable. PPP would regret this as PML N is regretting not repealing article 62 & 63. Ironically on one side they would continue to say bring issues to Parliament and when issues are brought there they resign from committee. NAB chairman should not go. Appearing before the House on a matter such as this means, interference with NAB's duties.We are ashamed of our Parliament for setting hurdles in NAB's ways. Just to save a thief, all institutions are being maligned. Pakistan is becoming worse than a banana republic. This is not small allegation. If they are investigated, nawaz sharuf suddenly anti state statement. All cannot be ignored. Looks like nawZ sharif is yet again hidding something like wealth. @Himmat Instead of NAB, the accused are accountable and should clear their position. Its' NAB's duty to investigate allegations and NAB Chairman has not done anything wrong. If NS is clean, he should prove; why so much hue and cry. Pakistani nation has only these topics on electronic and digital media. One think, what is the utility of knowing, not knowing, this worthless material to individuals or the national as a whole. All panel members who have NAB cases pending against them should have recused themselves because there is a clear conflict of interest. @Himmat "Nab Chief should explain his source of information" Rulers should not explain their source of wealth, but those investigating them should explain source of information!!! Next will be CJP - ridiculous! @Shah Nawaz Khan dear why they need to issue a press release for this. They could have just initiated their investigation as they do in all other cases. The fact a press release is formally given to media indicates mala fide intentions. He will prove the sources just wait.